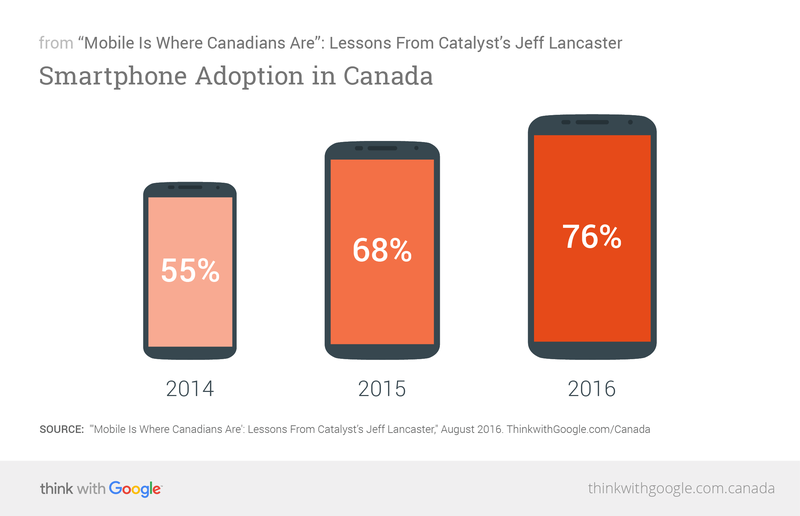 Catalyst, a Canadian digital marketing agency, recently wrapped up its third-annual survey on smartphone adoption and behaviour in Canada. Jeff Lancaster, CEO of Catalyst, pens this guest column, detailing what the research means for Canadian marketers and why "mobile is a must-have." Canadian consumers are unique in how they adopt new technologies, consume media, and make purchase decisions. That's why three years ago we started conducting research to better understand how Canadians adopt and use smartphones. This year, we conducted two studies: one among 1,000 Canadian adults who own smartphones and another among a representative selection of 1,000 Canadian adults to help us determine the proportion of Canadians who own smartphones. We're excited about the results because, more than anything, the data shine a light on all the potential opportunities there are for digital marketers in Canada. We're three years into our study and mobile ownership in Canada isn't slowing down. Up from 55% in 2014, 76% of Canadians now own a smartphone. Other popular devices like wearables have a 10% adoption rate. What we're seeing is that smartphones are Canadians' remote controls for their lives. When people want to interact with each other or get any kind of information, they pull out their smartphones. Despite these huge increases in Canadian mobile ownership and usage, there's still a gap to be closed in how we spend our marketing dollars and where we place our marketing efforts in this new mobile playground. Put simply, mobile is no longer an option—it's a must-have. Brands and agencies should be thinking mobile-first on every campaign, both in terms of digital assets and how they're interacting with consumers. Our study shows that mobile is where Canadian are. And if your brand isn't there, your competitors will be. Canadians are on mobile more than ever, but consumers are also pickier about what they download (and keep) on their phones. In 2014, we found Canadians had an average of 27 apps on their phones. This year, that number is down to 18. People settle down to a core group of apps they use regularly and then they go to the web on their smartphone for everything else. So brands need to ask themselves, "Is an app right for us? Can we deliver something that people are going to go back to on a regular basis?" Getting people to use your site or app on their smartphone is all about making a connection. And that starts with utility. When you understand the consumer—the problem they're trying to solve, what they would use your site or app for, and what's most important to them—you can build something useful. 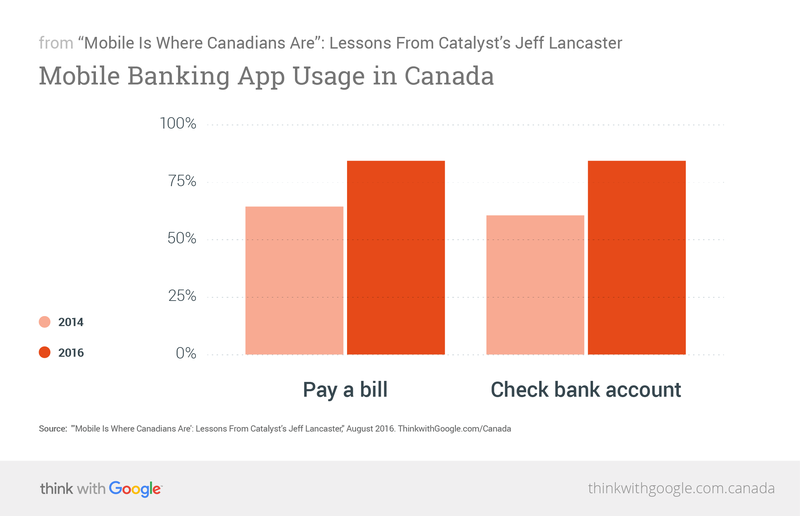 The major banks have really stepped up the utility of their mobile apps in the past few years, and Canadians are noticing. Basic functionality like checking an account, paying a bill, or depositing a cheque are now just as easy to do in these apps as they are in a browser. 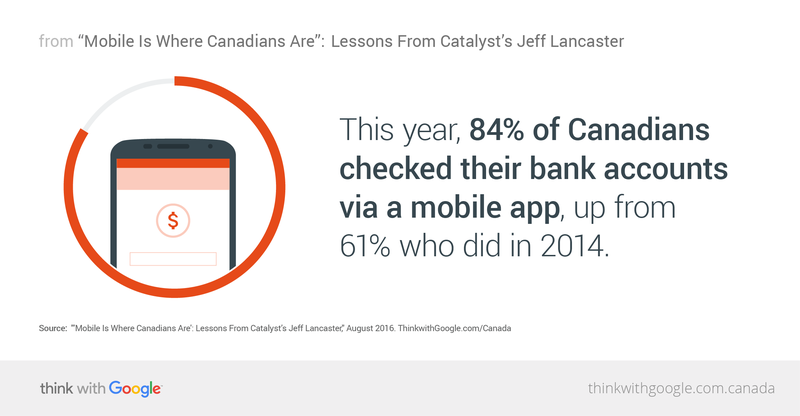 And this year, 84% of Canadians checked their bank accounts via a mobile app, up from 61% who did in 2014. Next, think about how your brand can be useful to the needs of mobile searchers. Can you answer a consumer's question with your brand answer? The key opportunity here is curated content development: creating articles, videos, images, or any type of digital asset that will meet a mobile consumer's need in the moment. If you can crack this code, you'll perform better on search and be in a better position to get consumers to come to your store or location or buy your product. After ensuring you're providing useful experiences, the next focus is user-friendly interfaces and experiences. The number one frustration for mobile searchers in our study was slow load times. It's 2016 and frankly, people aren't going to be okay with slow-loading sites, pinching, or zooming anymore. It goes back to the old adage, "Don't make me think." If people have to figure out how to use your site or app, you've lost them. What I'm really excited about is what Canadian marketers can do with data. The connected world we live in allows us to know more about our customers, and if we can boil it down to the essentials without getting overwhelmed (which, I know, is a challenge), we can all create better experiences for consumers. With first-party business and consumer behaviour data, second-party platform behaviour data, and third-party syndicated research, we essentially have a real-time ecosystem where we can get a clear view of what consumers are looking for and how they're looking for it. When we leverage those data to develop content and strategies, we can make connections with consumers based on what they need. Mobile technologies like beacons and other location-based services are a good example. Being able to determine people's contexts will help us anticipate needs and give people better, more useful experiences. This also holds true for things like cross-platform research. As consumers move from device to device, getting a handle on where and when they complete different parts of the purchase journey will be critical. We're in the business of helping brands make better use of data; and with more data sources and tools available, we can create smarter and better strategies together for the unique Canadian consumer. I'm excited to see what Canadian marketers and brands can do in our bright mobile future.